A pedestal sink is the traditional choice for a bathroom sink at home. If you are looking for something different, you can always choose a basin sink. A basin sink has several types to choose from – countertop, inset, and undermount sink. Whichever you choose, it will surely add appeal to your bathroom. After choosing the fixture, the question most people asks next is how to install basin sink? Though only a licensed plumber should install a basin sink, it’s still advisable to learn how to install basin sink. This is to immediately determine if you receive all the services you paid for and if it was done accurately. Reading the wash basin installation instructions manual is a great start. But to make it easier, here’s the basic step-by-step guide on how to install basin sink with its tools checklist. How to install basin sink? The first step on how to install basin sink is to remove the old fixture first and ensure the new countertop basin has the same size as your old ones. But if you are installing a countertop basin sink in a new bathroom, you must place the new fixture on top of the counter and put some marking. The marking will serve as your guide when you cut out the counter. If you want an easy way, you can print out a template of the countertop basin fixture. Place it on the counter and secure its edges with tape. *Note: Include the position of the faucet as well on the template to ensure their right position. The second step is to drill a hole in one area of the counter and use a saber saw to cut the shape out. Once successfully removed, you must smoothen its edges by sanding it. The third step is to put a line (about 2-3mm thick) of silicone sealant along the edge of the basin sink before placing it on the bathroom counter. The fourth step is to mount the new basin sink on top of the opening then press it hard and let it dry (maximum of 24 hours). The fifth step is to secure the unit to the counter. Commonly, this can be secured by bolting its connective clips under the counter with screws. 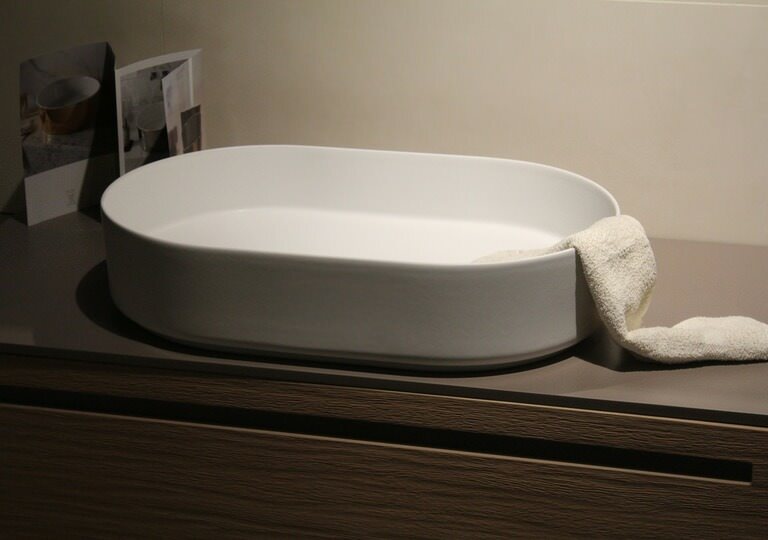 But there are some that have a different securing method (depending on the basin’s design or manufacturer). So, it’s advisable to read the wash basin installation instructions manual first. The sixth step is to install the faucet fixture by nailing or screwing it on the counter. The seventh step is to fill in the gaps in between the basin sink and counter with a sealant. The eighth step is to install and secure all the pipes and hot and cold water lines. To know the complete details on the wash basin installation instructions manual. The last step is to open the water supply then the faucet to test for leaks. *Note: The installation procedure will only change depending on the type of the basin sink you will install (e.g. inset, wall, and others) and their manufacturer (read wash basin installation instructions manual for your reference). Upgrading your bathroom sink is a treat for both you and your home. And to ensure it will last for a long time, you need to choose a durable material. What is the best material to use for a bathroom sink? The best material to choose for a basin sink is cast iron, steel, and natural stone. The cast iron becomes a good choice because of its high durability and has a classy white appearance. But if you are not a fan of white, cast iron comes in different colours. The only downside of the cast iron is it is heavy. You must ensure that the foundation of the counter that will support this basin sink is stable. Steel is not a common choice for the bathroom sink. But because of its good resistance to stain, heat, bacteria corrosion, and germs, it becomes an ideal bathroom sink material as well. Not to mention that it is 100% recyclable. The only downside of steel is the sound it may cause, it can be loud. Natural stone is one of the best materials not only because of its’ beauty, but it is environmentally friendly. It has a variety of options – granite, green jade, marble, and onyx. The good advantage of natural stone is it can’t easily dent or rust. The disadvantage of natural stone is just like with cast iron, it is heavy. So, you need to install additional support to ensure the stability of your bathroom sink. Maintenance and care are highly required for these types of material. That’s the reason manufacturers clearly state the instructions needed on the products’ wash basin installation instructions manual. If you have other concerns or needs about basin sink installation or bathroom renovation, don’t hesitate to seek assistance for a reliable expert! HIREtrades is a one-stop online marketplace for connecting consumers and businesses, covering 200+ trades and serving all states across Australia. Visit our dedicated Bathroom Renovation page or Get A Quote by filling out our quick and easy form. How long does bathroom resurfacing last?